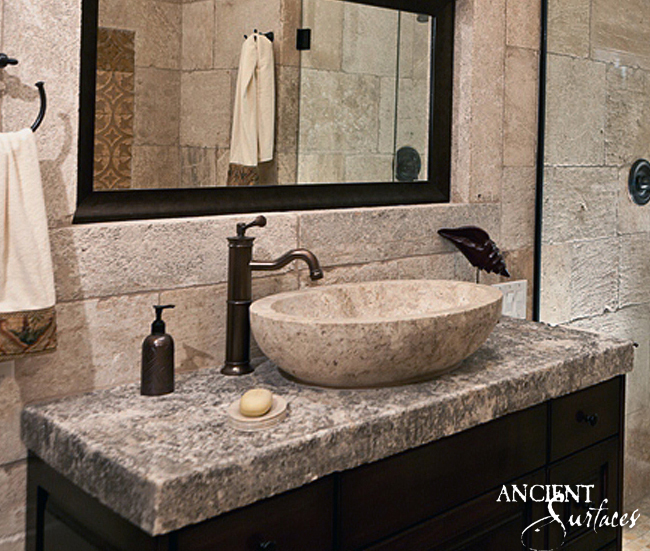 limestone sinks | Old Stone Sinks by Ancient Surfaces. 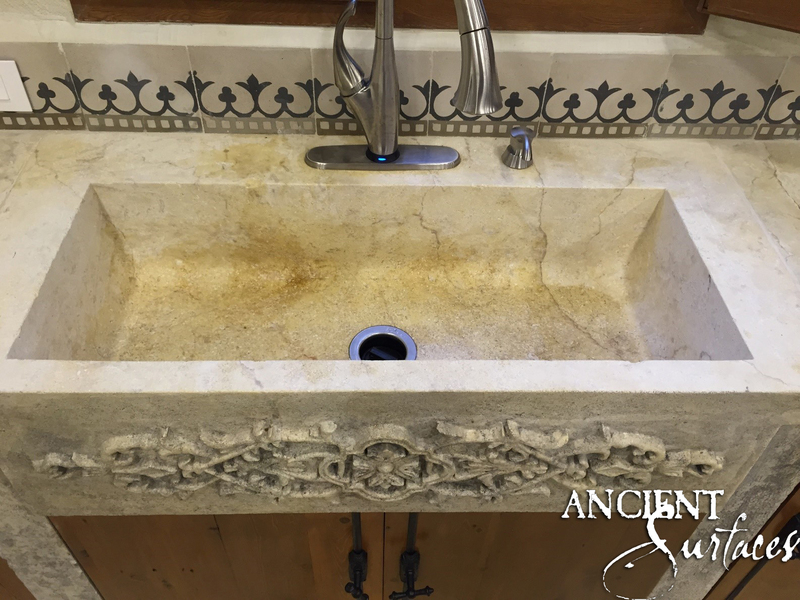 Most people fall in love with antique reclaimed Limestone sinks that are centuries old from the first few moment they lay eyes on them. 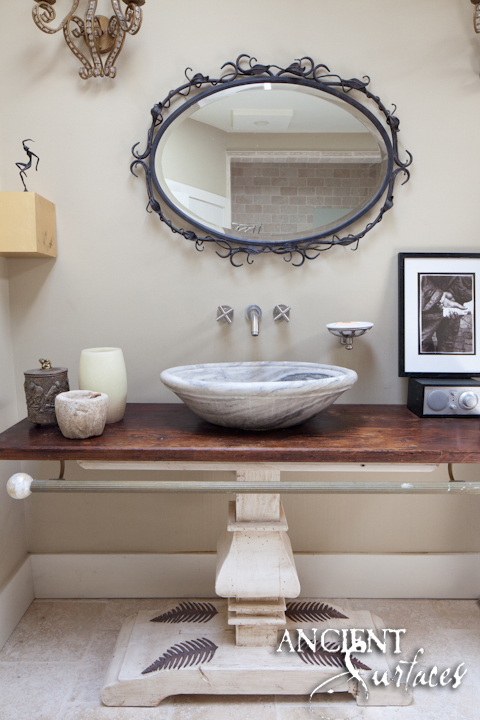 A client once said that if can could hoist one of our antique sinks up 100 fleets of stairs into his New York penthouse just to replace his impersonal, modern powder room sink he would be up for that challenge. 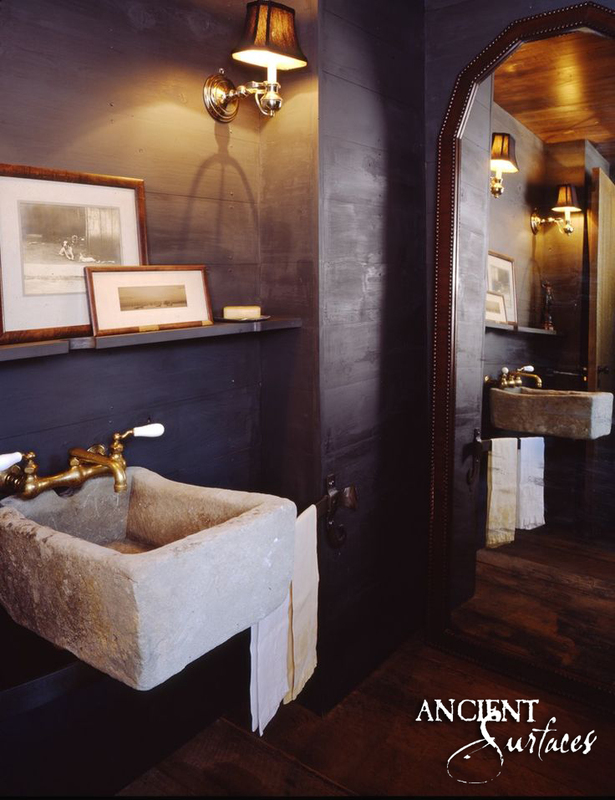 He was enchanted with our sinks uneven yet smooth to the touch edges and taken back by the historic patina of the stone that took centuries for its formation. He took that passion for old limestone to heart and added many of our sinks to the full container order he had us ship for him from France. 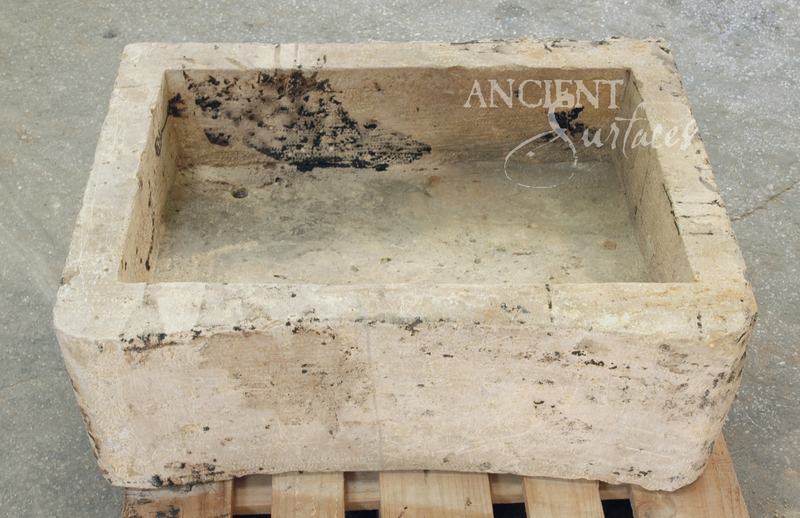 A gorgeous antique marble ribbed sink that was shipped from the South of France to New York in a full container. See above the photo of another simplistic yet timeless sink element he has acquired from us. 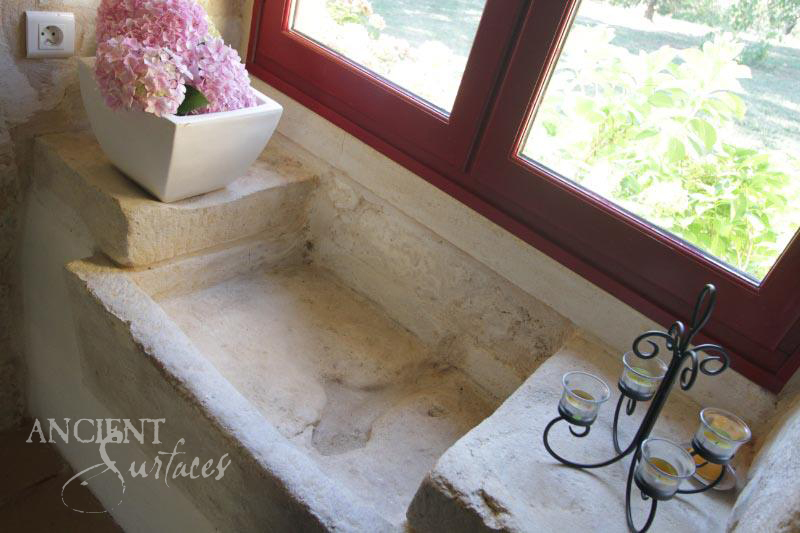 It’s a 17th century converted French Farmhouse stone sink that our client had his heart set one to moment he saw that photo. He liked the fact that it has started to collect vegetation and moss from having sat there in the yard undisturbed for nearly 15 years covered with purple flowers and ladybugs. 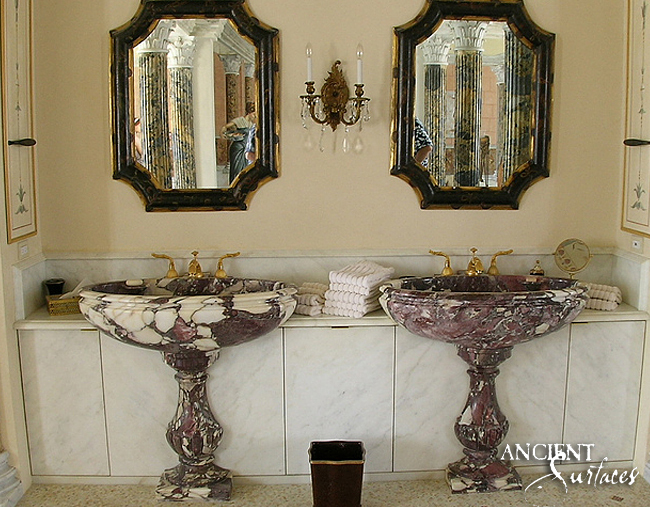 In addition to our crusty antique limestone sinks that will eventually reside in some of the prettiest kitchens and powder rooms of America, we also carry a few amazing antique marble shell sinks that our many friend designers and architects end up installing in their powder rooms projects just like this client did. 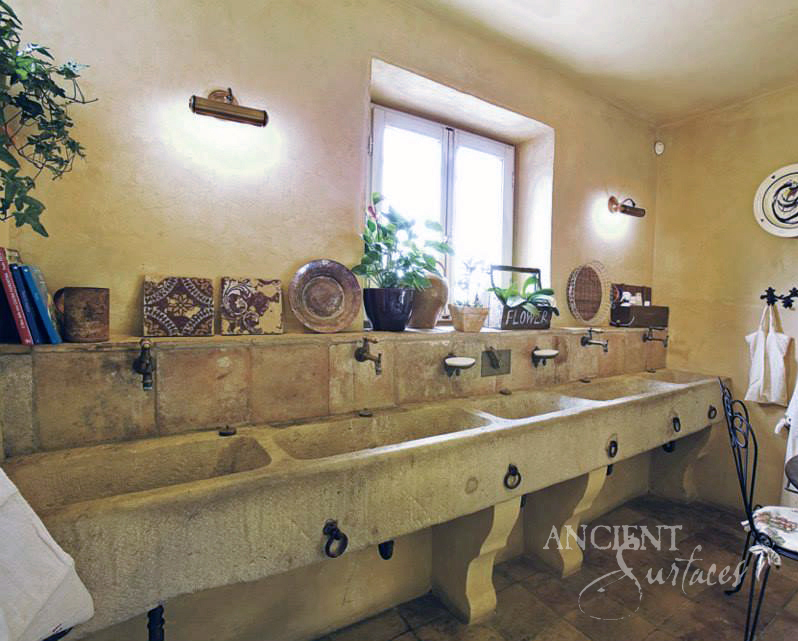 One of the original antique Italianate marble sinks that were reclaimed from a 17th century ruined villas. An inspirational photo showing similar antique shell sinks as seen installed in a French home showing a ‘his and hers’ antique sink layout. 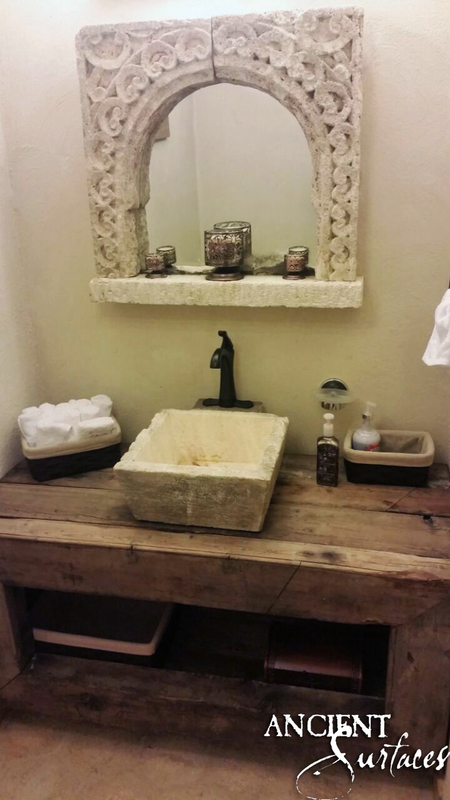 So many ancient marble sinks were among the 200 plus items shipped to that client who ended up furnishing his Texas ranch as well! We can’t wait to see the final properties coming to life, filled with our ancient elements juxtaposed with the modern furnishings in a modern architectural layout. How will they be used? With a little inspiration from our past project database of images, most of the guess work is normally taken out of the final design equation. An old and crusty sink that was to sit on a thick stone slab sheet with a modern linear glass tile mosaic back splash and a minimalist nickel faucet above. 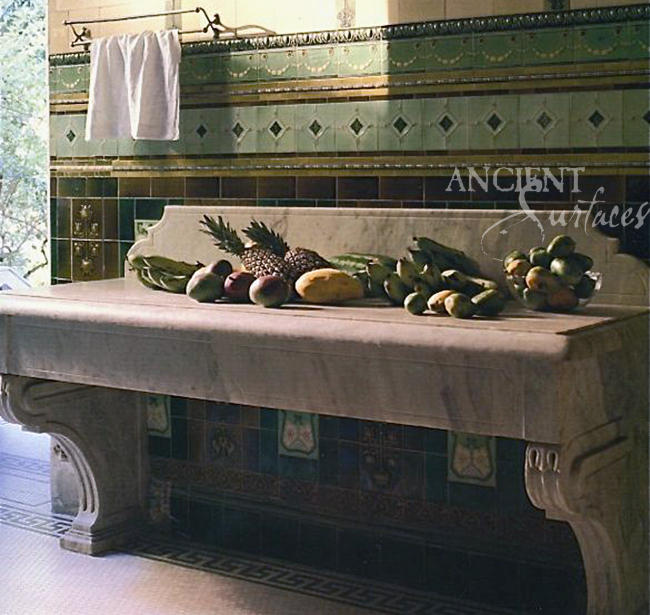 A similar Italian house trough sink was also proposed for the second guest bath at one time. 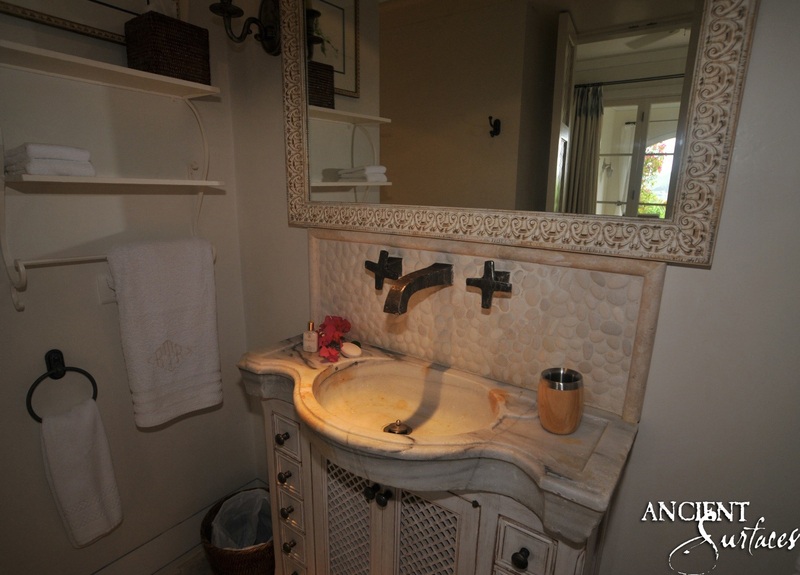 A French Chateau Sink was the first contender for the Master bathroom sink. 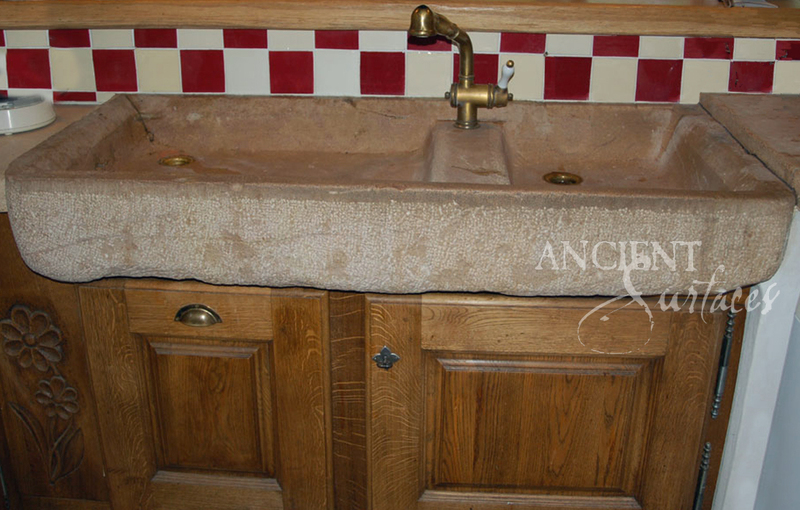 A possible option for the French farmhouse vegetable sink to be installed into the Antique limestone island. This was another interesting design contender for the main kitchen sink. 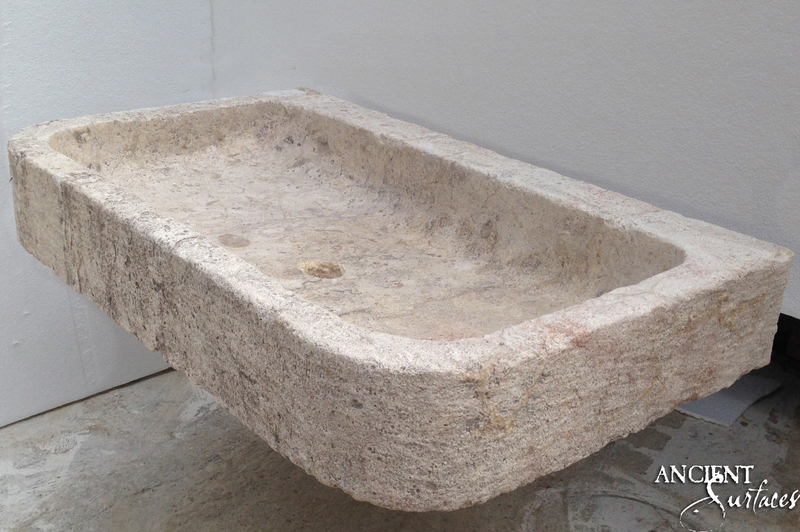 An original Stone sink. This was a possible option for the main French farmhouse sink but proved to be harder to configure into the existing design of the kitchen. 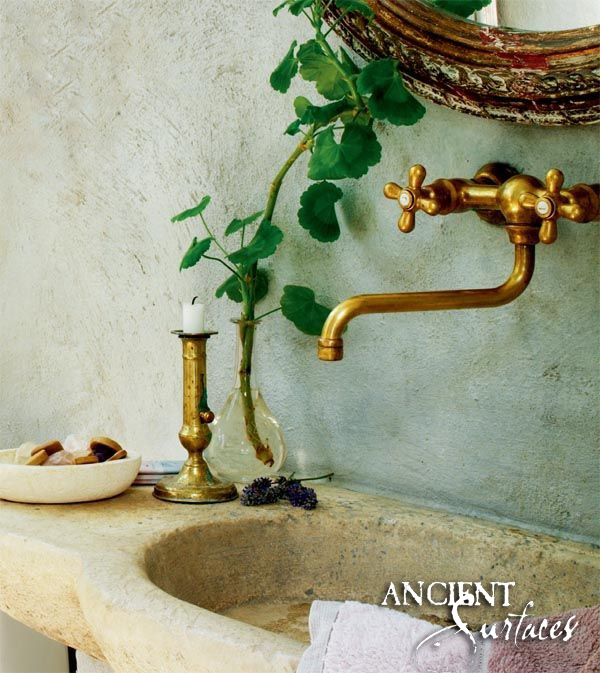 An unusual antique planter sink that could be re-purposed as a wine cellar or wine tasting room sink. 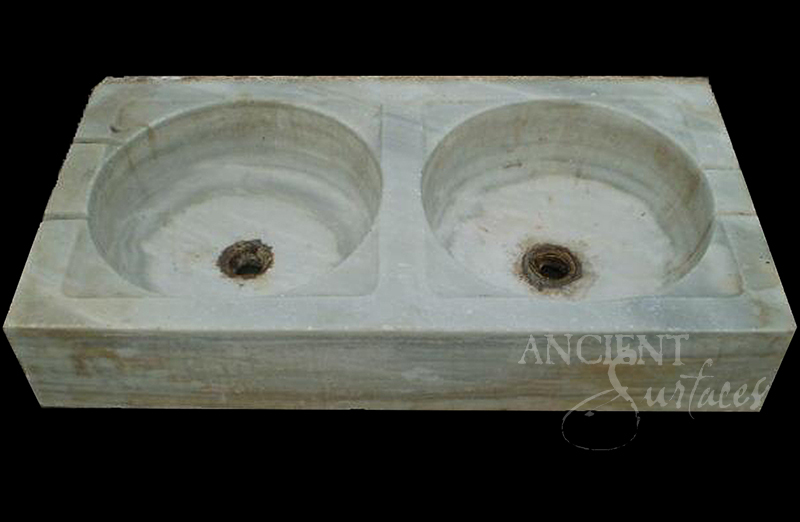 This beachy antique marble sink turned out to be a few inches off from what the designer was hoping for. Luckily a similar but narrower sink was available. 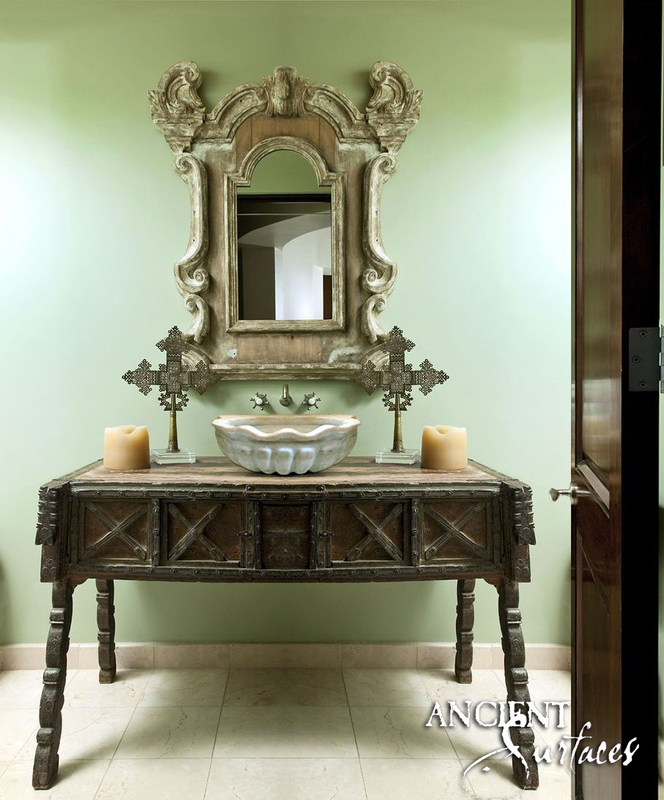 This inspirational photo was so close in design and size to the real antique sink we had in stock at the time. That’s the one we picked at the time. It was later replaced by a 38” wide sink that was close in design. 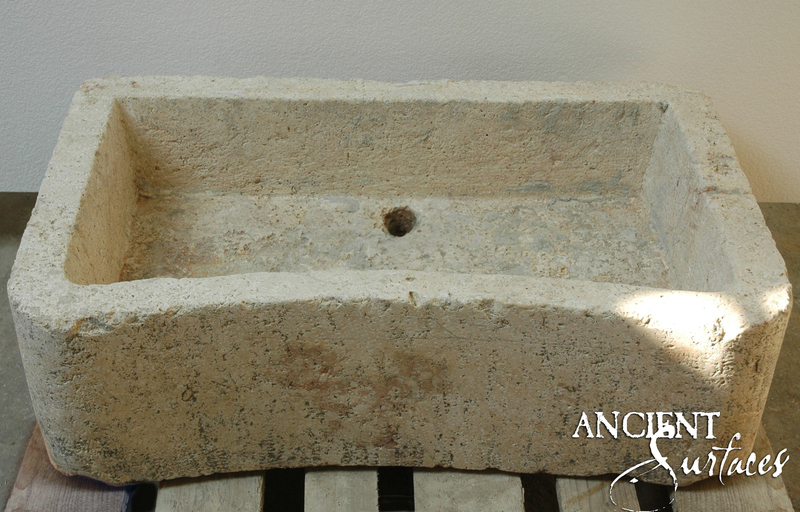 This double sink antique limestone trough was a bit deeper that what was engineered for by the architect. A Very West Indies Caribbean looking sink that was replaces last minute by an oval shaped sink. 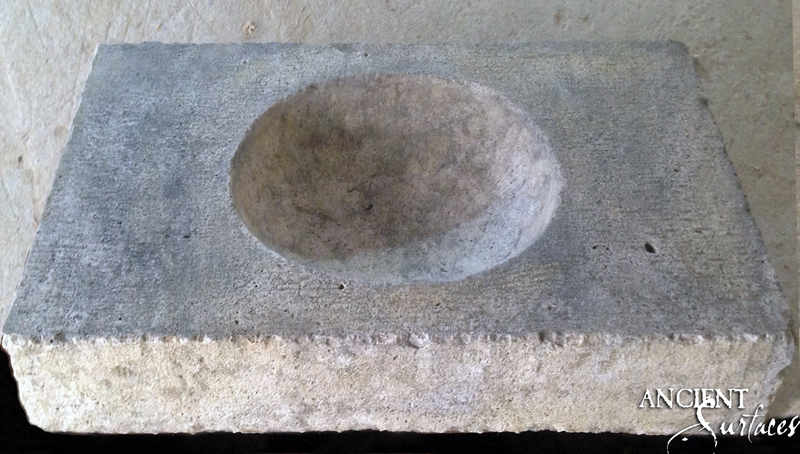 An ancient Limestone block carved out by our carver. It was about to have a customized sink hole for fitting the drain pipe in before it was deselected. This inspirational sink design is supposed to have the faucet mounted from its wall side since it has enough stone depth to drill into. 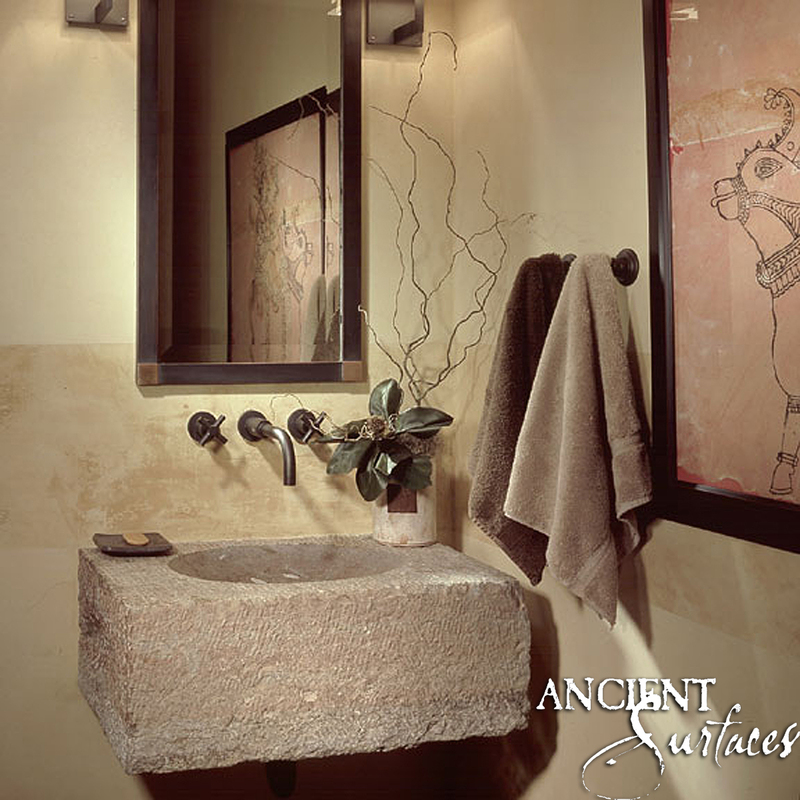 It is hard not to fall in love with a solid standalone piece of rock that is hundreds of years old and harder not to want to see those thick stone treasures retrofitted into kitchen and bathroom sink in the most interesting homes and villas all across the world. 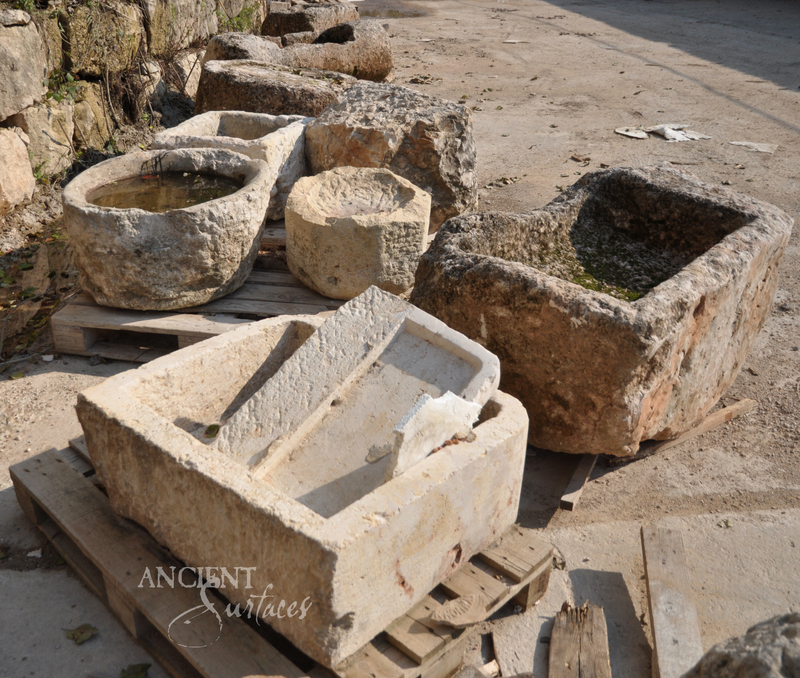 We hope that one day you too will take that same journey in time and space and start selecting not only your sinks but your stone floors, walls, fountains and fireplaces from our unique local US and European stocks. Getaway room of the house. Being the true place of relaxation, a well-designed bathroom rewrites the normal bathroom experience and invites us to discover hydrotherapy in its basic form. 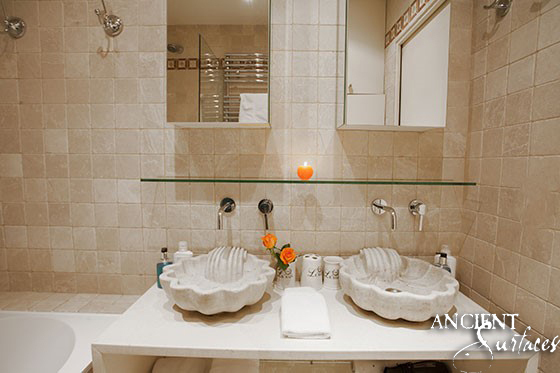 Like a well-orchestrated classical symphony, the various bath elements need to work in unison. Well focused lights that can be dimmed and directed on command, artfully applied Venetian plastered walls, inclusion of key stone design elements from floors, sinks and tubs, perhaps the inclusion of live plants, eclectic pieces of furniture and last but not least music. 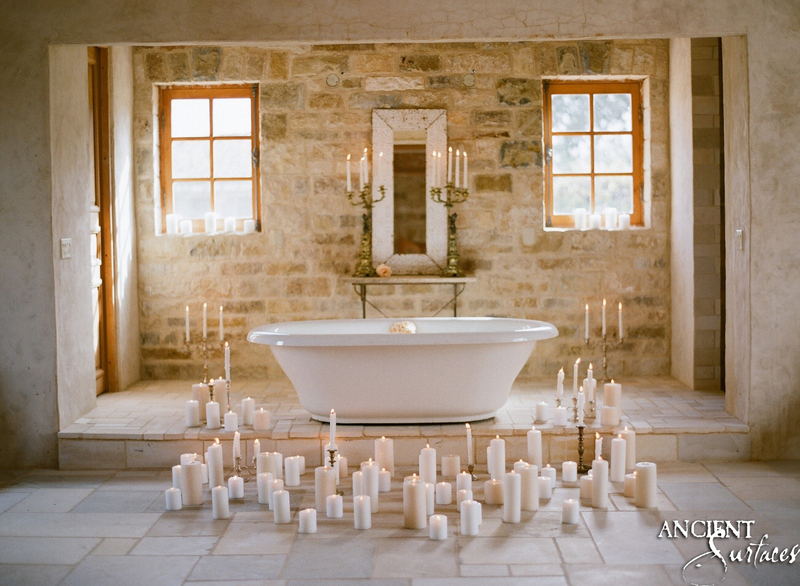 Stone walled showers, classical stone bathtubs, prestigious hand carved sinks from basalt to marble, limestone floors salvaged from the south of France are some of the many splendid craft of our trade that we employ in order to transform any bathroom into a personal spa. 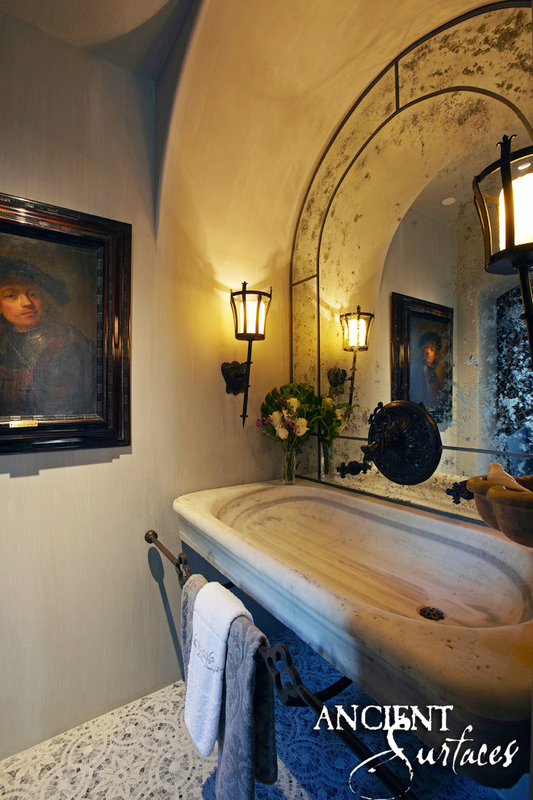 Get rid of your old neon above your sink and adopt a chandelier for an unusual chic bathroom. In this piece, we opted for a nice classical metal luster that fits perfectly into the mood of this place giving it a fifties look with a nice Belgium black basalt for more majestic look. Enjoy! Finding a place in the bathroom to tidy up the towels gets frustrating for some of us when you’re limited by your bathroom space. The solution is to put them on a limestone rack beneath a trough limestone sink, on a window sill or the edge of the bathtub. 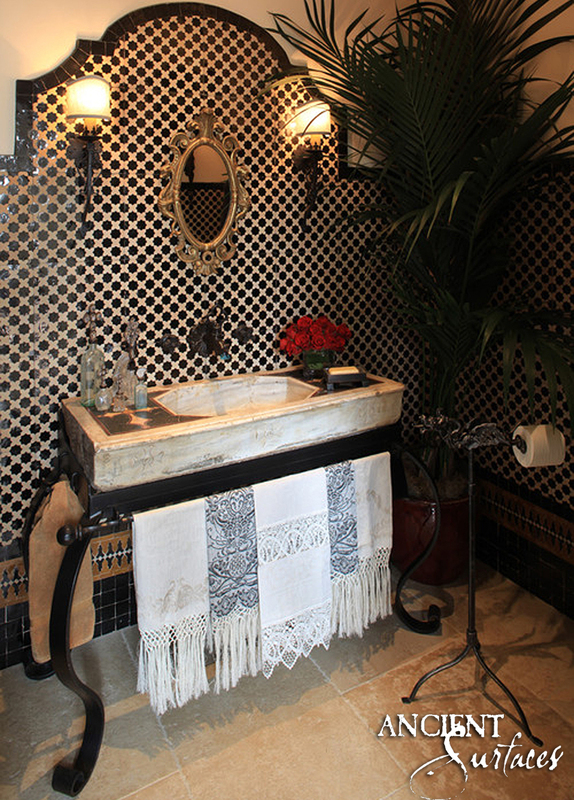 We cannot merely give up and throw our hands in the air at the sight of our conventional bathrooms that are ailing from the standard fixtures and finishes all through. As they say, Rome was not built in one day. 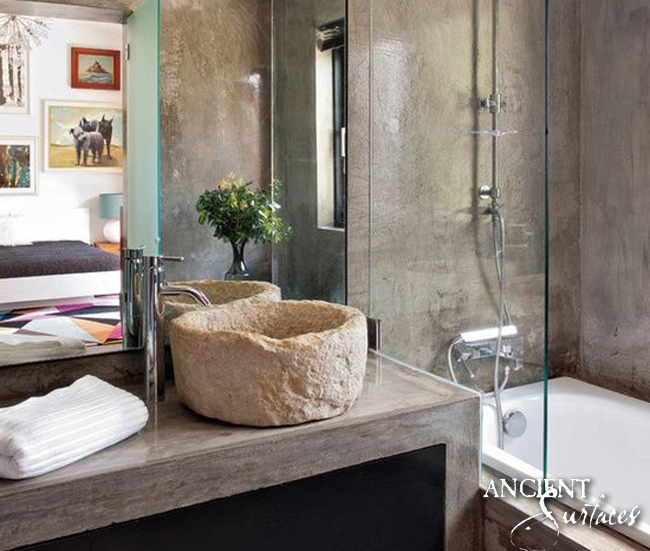 Every well thought of and well-designed bathroom can be slowly built one small project at a time. 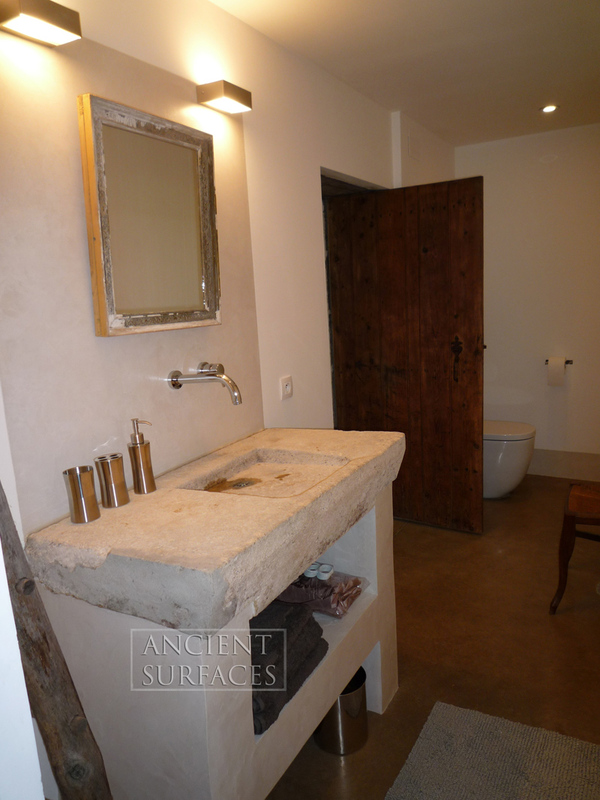 Take for example the installation of a mortar marble sink with a thick antique limestone vanity as its support. This 2 day project can take place before or after your retiling or plastering of your walls. 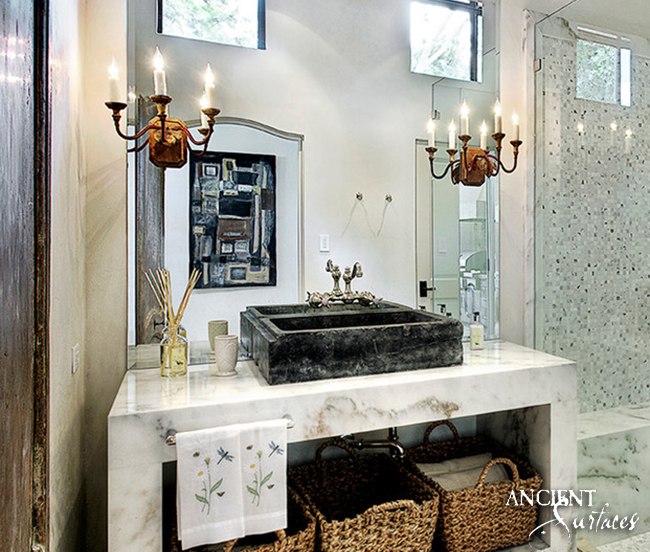 A small space doesn’t have to mean a diminutive vanity. In this tiny powder room, choosing an undermount sink and adding a clever tile accent along the walls makes the room look larger. 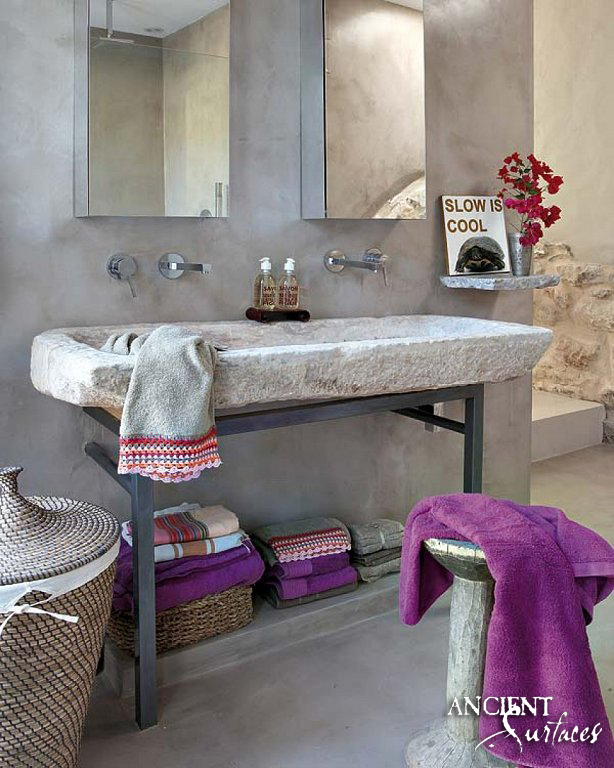 When your bathroom is large enough, do not hesitate to install a seat that will highlight the warmth to the room. Take this photo for example. A beige wingback chair blends into the New England 1800’s styled Bathroom. In this case, you can’t help but feel the retro 19th Century New York or Boston Barber shop spirit in there. Easy to create and will timelessly remain beautiful and trendy for as long as this house stands. Frustrated by a lack of space for a sink? 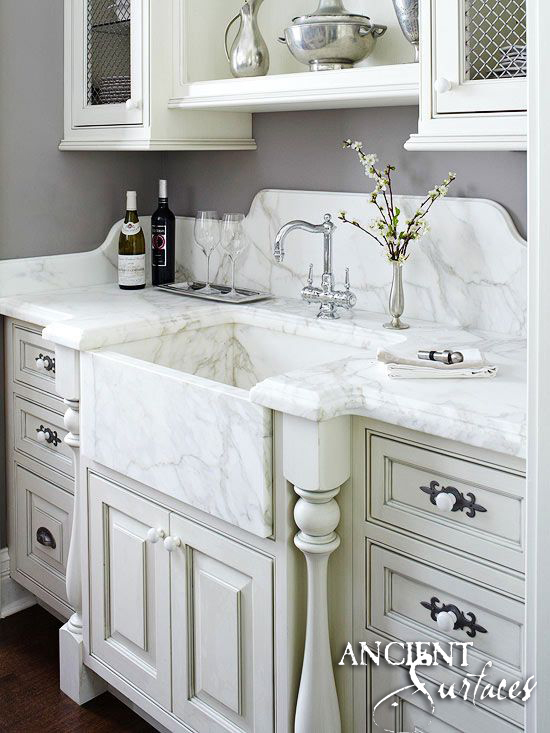 Pedestal sinks are terrific space-savers that will still leave you with a feel of an open space which is lost with cabinet vanities. To make up for lost storage space one can add a short wicker basket that will store additional towel, soaps and other bathroom novelties. 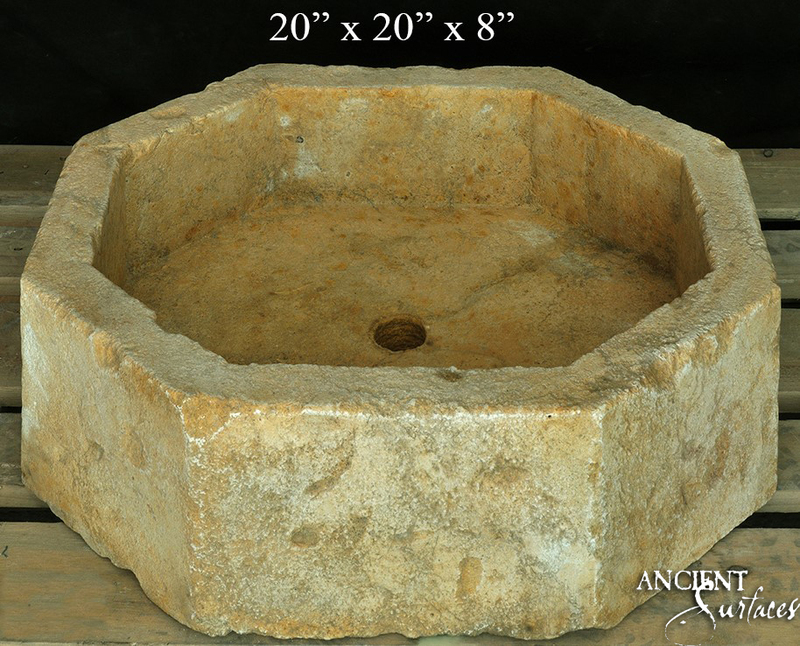 A water trough is a hand etched piece of a naturally occurring rock that the shepherd from thousands of years ago had found convenient to hollow out and retool into a rectangular shaped blocks, in order to fill up with water at various resting spots along their grazing trails for their cattle to rest and quench their thirst from. As agrarian lifestyle took shape some 4,000 years ago in Europe and man slowly moved away from a hunter gatherer life style, Cattle breeding has also taken a geometric leap forward. During that period onward limestone Troughs have also taken an added role of enabling farm livestock to be kept well stocked up on drink water allowing for a greater animal population maintained at any given time. 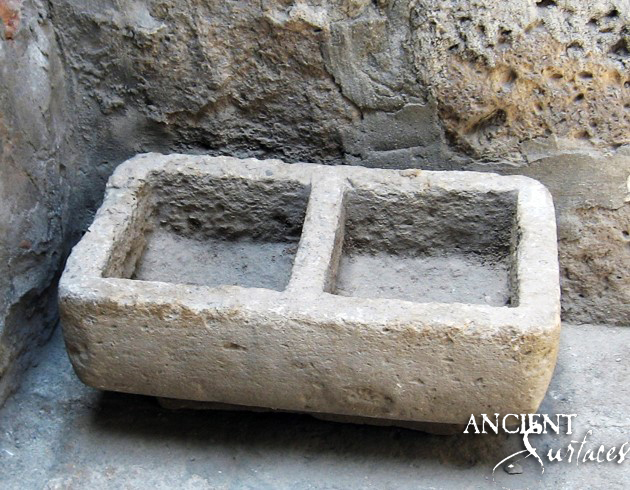 Whether assisting shepherds who were finding a hard time to provide water for their cattle when travelling long distances or servicing a growing flock of farmed animal back home, Limestone troughs offered an ever ready solution to shepherds, ranchers and farmers. 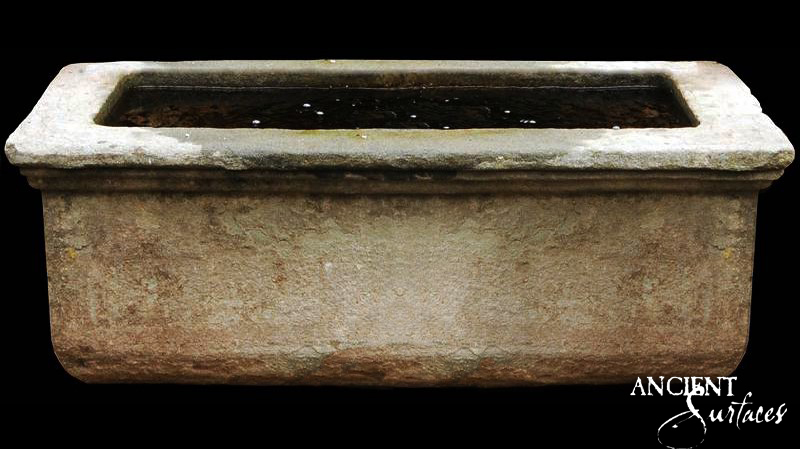 Trough stone is almost always Oolitic in nature which enables it to hold a full body of water without it leaking out at any future point in time. 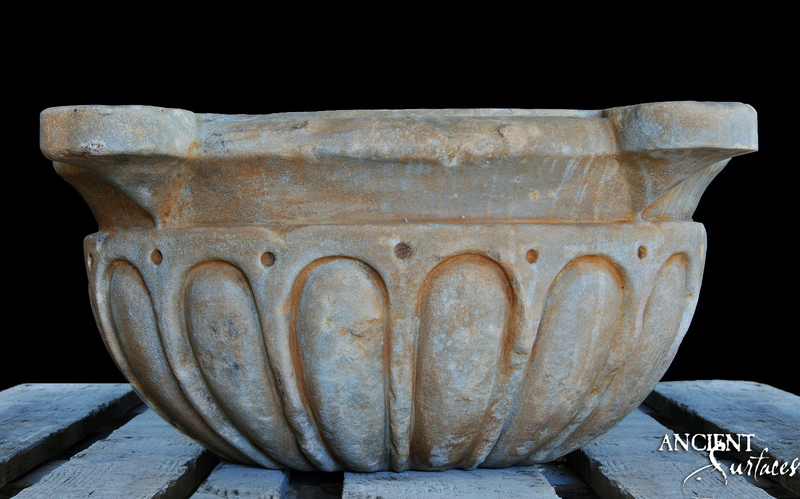 This unique characteristic of Oolitic Stone made those antique troughs perfect candidates for them to be re-purposed into modern day French farmhouse sinks. 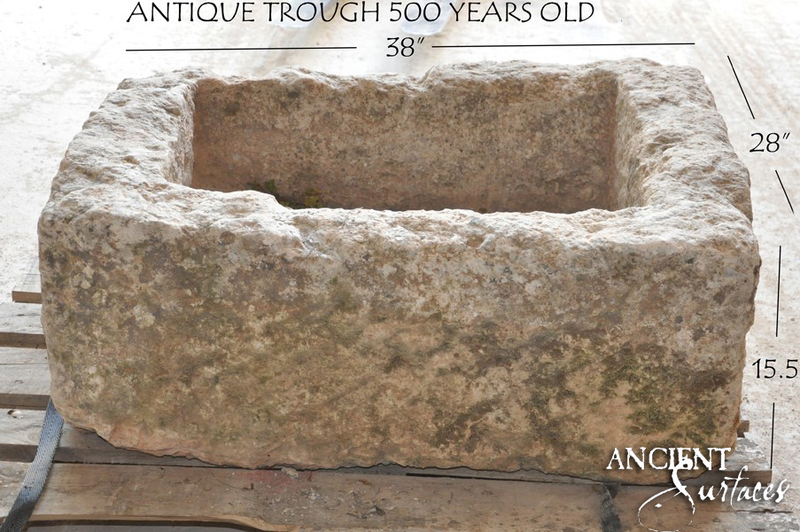 Years later after pastures and growing animals started steadily to fall out of favor in the European countryside of France, Italy, Greece, Portugal and Spain and started becoming restricted to only a few regions, overnight we saw an abundance of antique and unused Limestone troughs fall into disuse. The owners of these old Stone vessels eventually didn’t see an economic reason to keeping them in their fields. 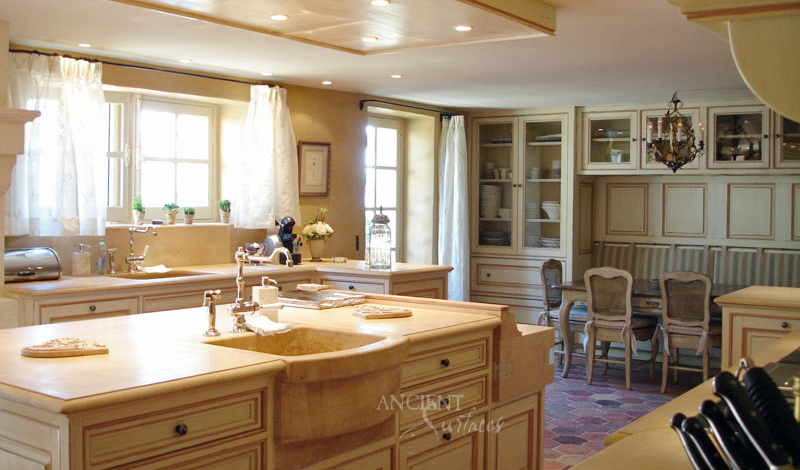 Some went to auctions and others to private dealers such as us at Ancient Surfaces, who were more than happy to purchase them from their estates so that we can converted them into breath taking French farmhouse kitchen sinks. They are very rough looking from the outside but centuries of usage and exposure to the elements have made them very smooth to the touch so when you touched their surfaces it may feel like a surface of soap or even a smooth as angulating glass; very smooth yet very hard. 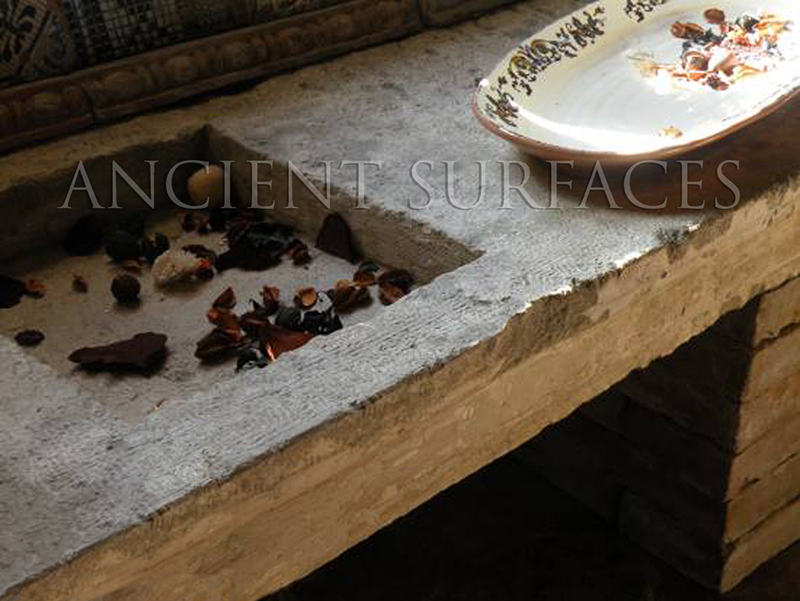 The inside surface was cleaned up honed out by our artisans which made them very suitable to be used as sinks, eliminating all crevices on the inside surface reducing any chance of water stagnating inside those trough sinks. 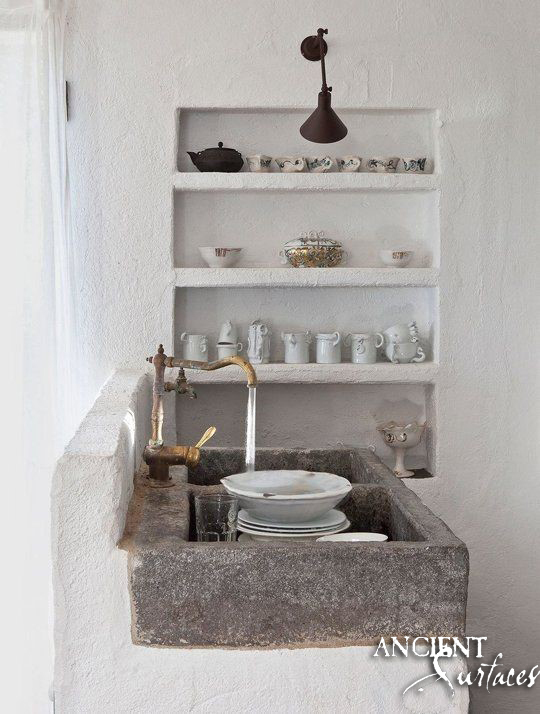 It’s amazing when you actually use a very old limestone through sink that looks very rough in a contemporary looking kitchen. 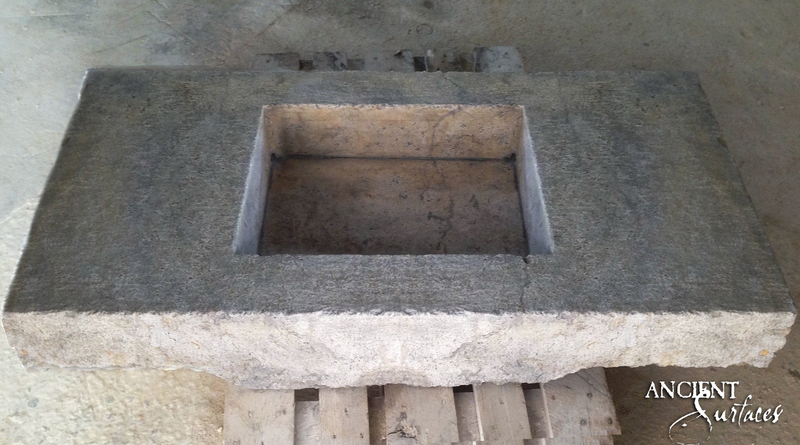 A thick stone trough can also be incorporated in your modern kitchen and can go perfectly along with any ultra-modern steel appliance. This old and new juxtaposition gives an added historical context and value to the whole design of the kitchen. 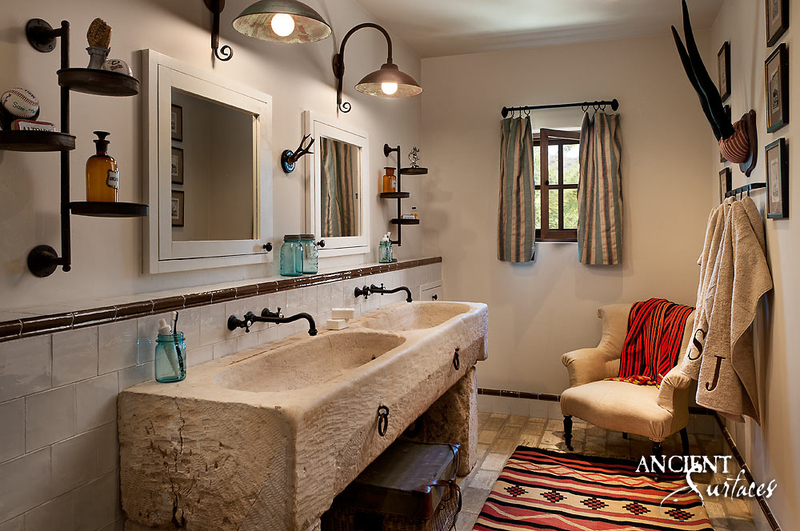 Antique Biblical Stone on the back splash, antique foundation slabs on the counter tops surfaces and a reclaimed 400 years old retrofitted French trough plays the role of the limestone farmhouse sink. 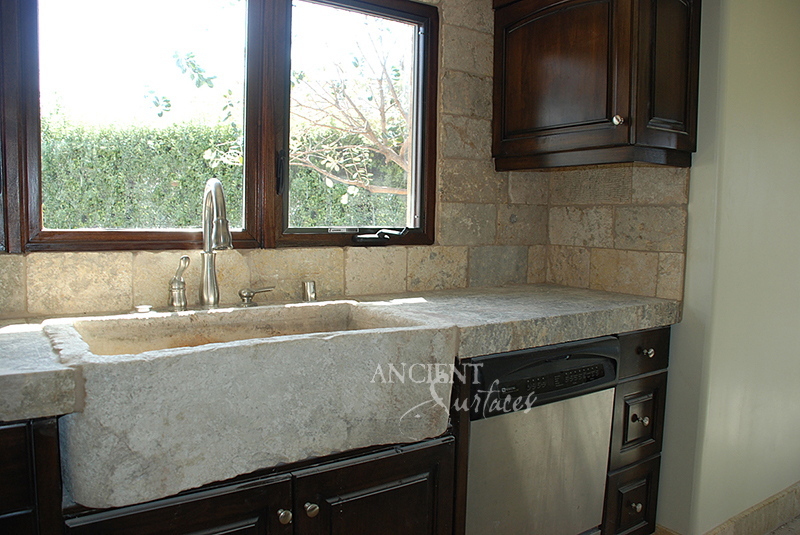 Antique Oolitic limestone sinks are possibly the best kitchen sink options one can install in their home. 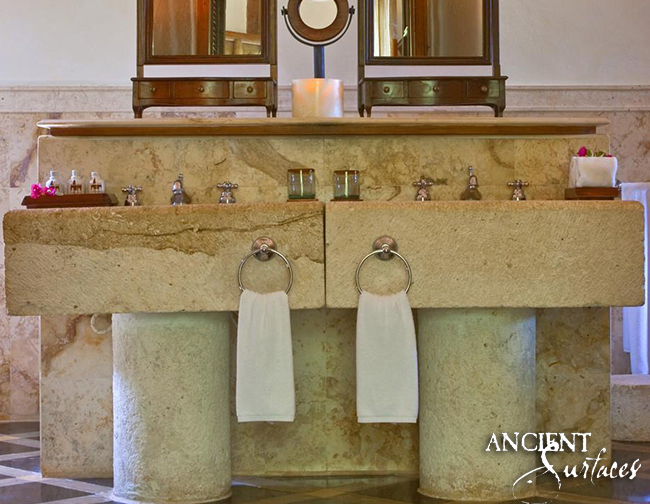 They have stood the test of time and are a living testament to the everlasting beauty and durability of antique limestone. 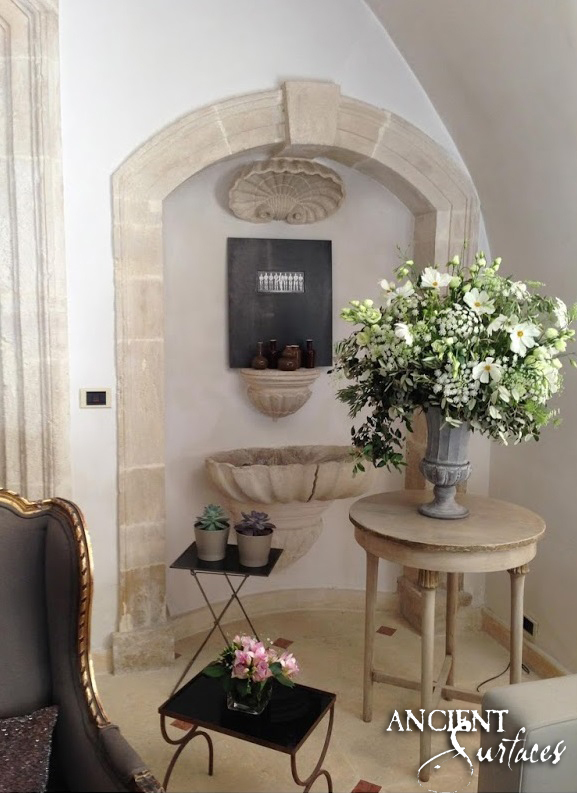 For years we’ve been providing one of kind ancient Oolitic limestone trough that can withstand the harshest ware and tear to them and have been paired with the highest end finishes and European appliances available on the market. 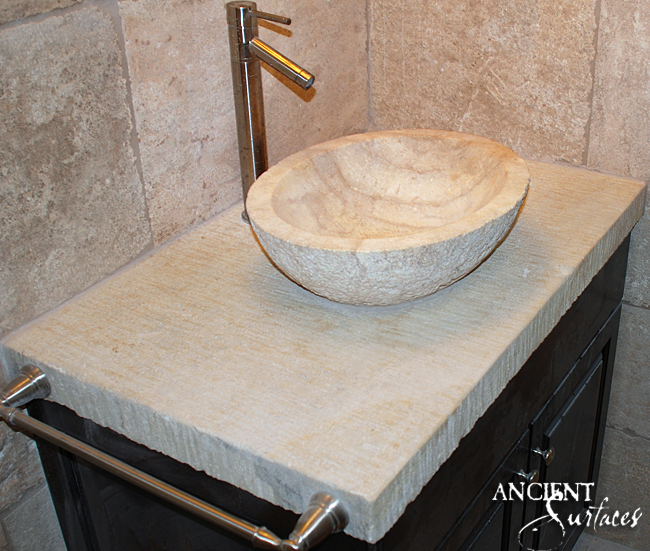 A perfect ergonometrically carved limestone sink reclaimed from a French farmhouse. 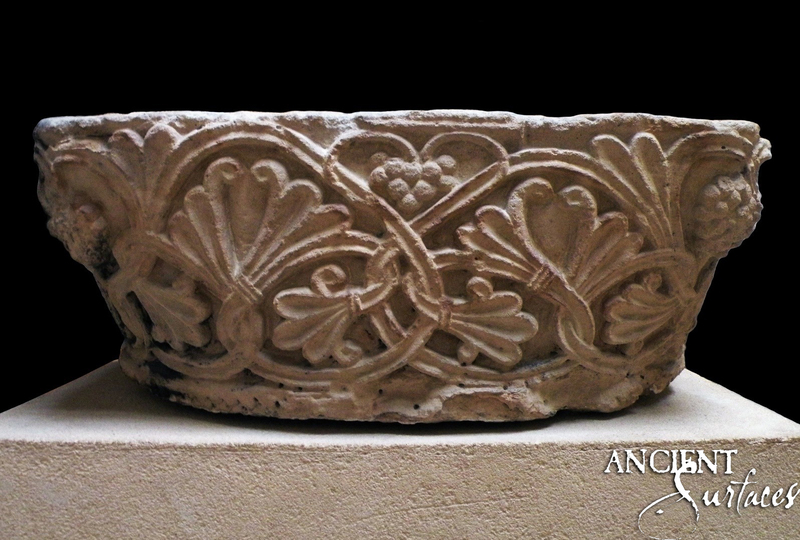 Oolitic Limestone is a truly rare and very dense type of limestone only available in a few pockets around the globe. It is know by many expert geologists to be the best of all Limestone types. only about 5% of known limestone in the world fits that geological classification. 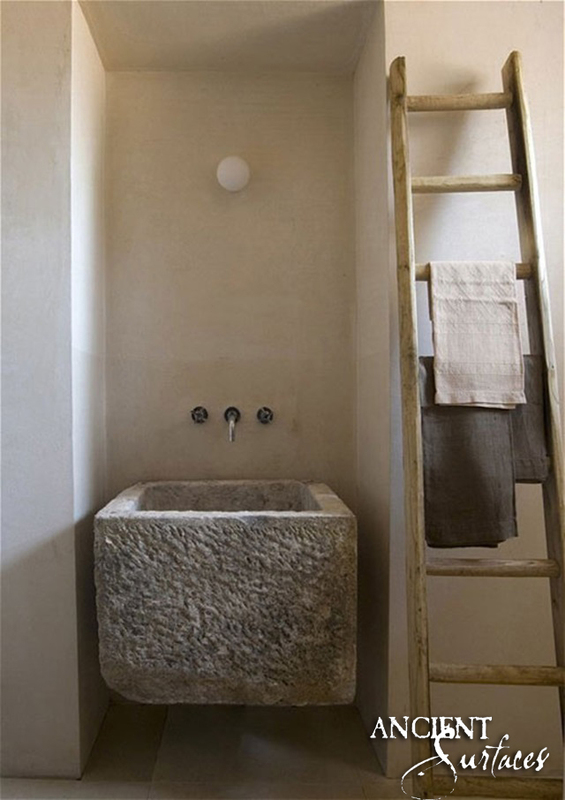 All the other types of limestone are much softer and are classified as Dolomites. 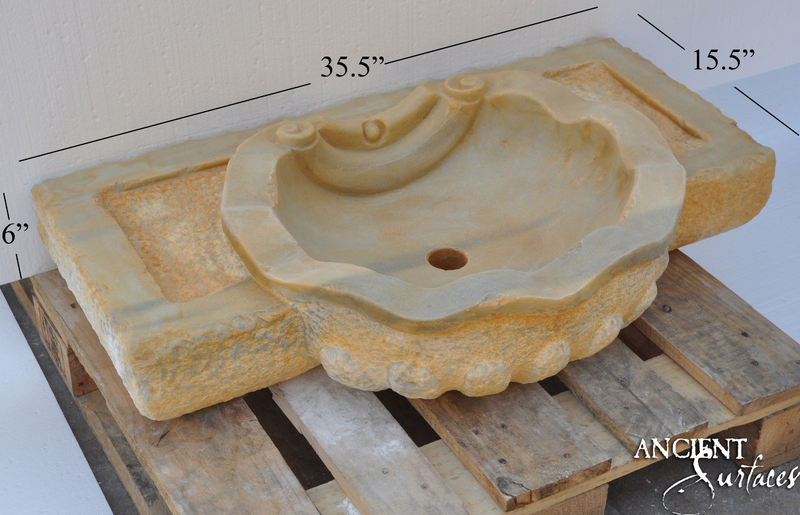 hand carved, deep, double Oolitic Limestone sinks are ideal in any style of kitchens and are suitable for all types of modern day food preparation. 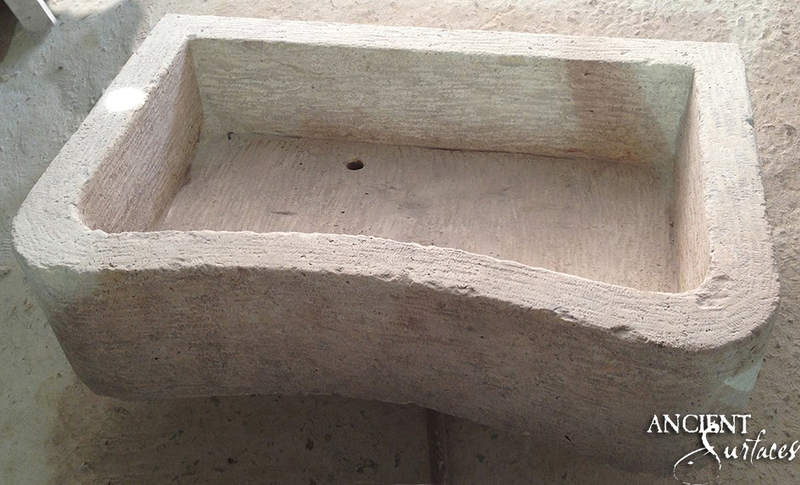 Now image having your kitchen sink carved out and hollowed by hand out of a solid chunk of custom carved Oolitic Limestone exactly fitting your architectural renderings and specs. Oolitic Limestone can be barely scratched even with the constant banging of stainless steel pots and pans. 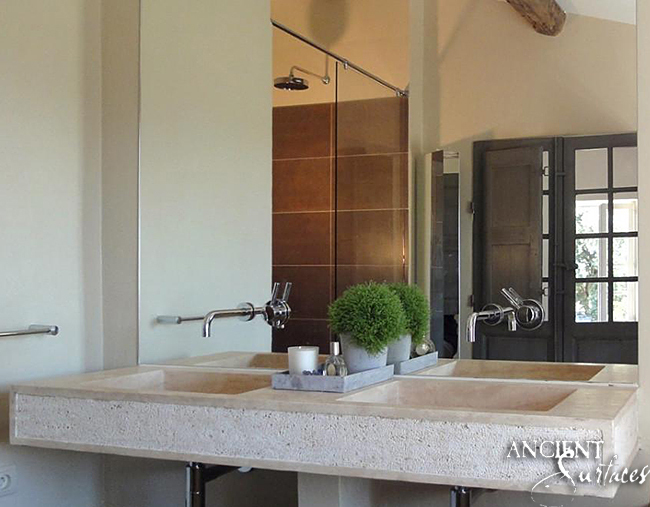 Both architects and designers have an affinity to French farmhouse limestone or marble sinks. They tend to design them into their projects as long as the client is able to visualize the historic beauty that each piece can bring into their kitchens. On the ‘Mohs Hardness Scale’ of our jet black basalt is comparable to obsidian black’s hardness also known as volcanic glass. Its density is 3.3gm/cc or only 0.2g/cc less dense than Diamonds. Not to shabby for a non-metallic rock. 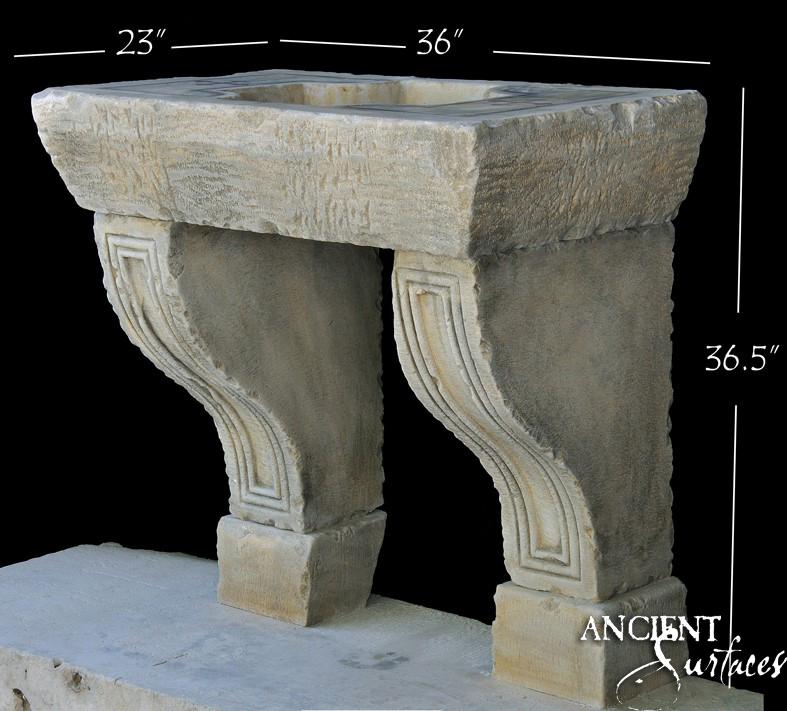 Custom carved Marble preparation table with corbeled legs by Ancient Surfaces. 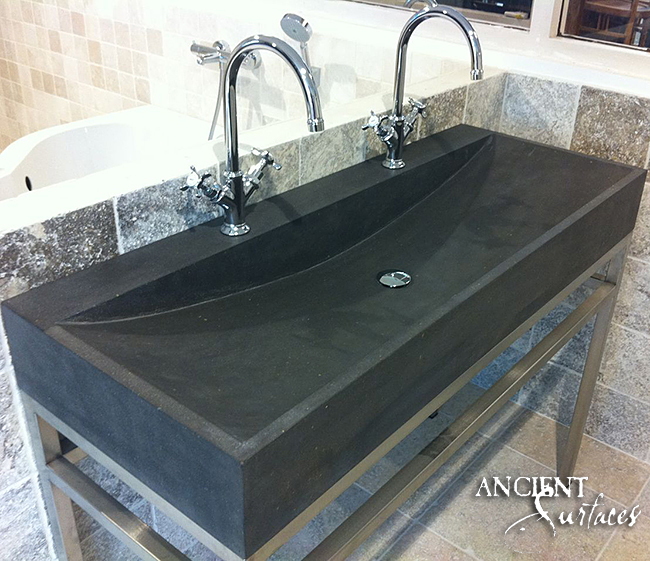 Having a jet black basalt sink in your kitchen is definitely considered a high-end luxury item by all means. 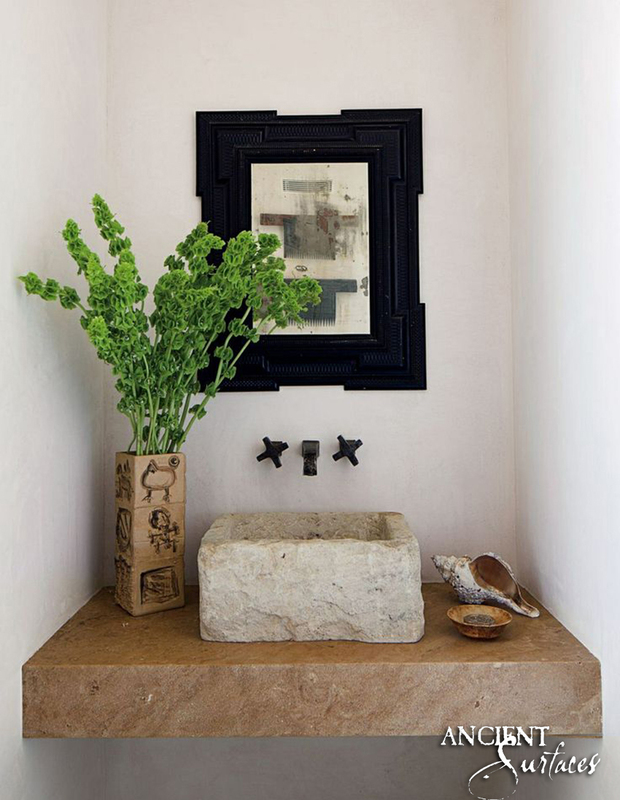 The hardness of this type of basalt and the difficulty involved in carving it makes it a very uncommon item while compared to other types of hand carved stone sinks such as limestone marble sinks.